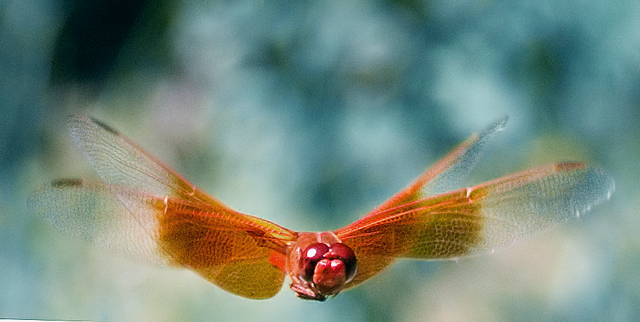 Definitely a standout image in the challenge due to the colors and the in-flight aspect. This image is distinctive because his legs are tucked up under him showing flight. Good work. Watch the tilt/crop next time to avoid the white corner. Holy smokes - that's a tough shot! Well done! (I've been capturing some dragonflys recently myself.) I like the bokeh behind the subject too, good complement. Wow. You even captured the patterns in the wings. Nicely done. Still feels a little bit soft, and a little noisy. An interesting crop, makes me wonder what the rest of that hint you've left in the bottom left is? ;^) This was advanced...could have cloned that little piece out. Just a thought. Good luck in the challenge. Looks like when you cropped and rotated you may have missed a bit in the lower left corner. Nice bokeh on this. whoa... is it a lucky shot? gotta be a rare one! Proudly hosted by Sargasso Networks. Current Server Time: 04/19/2019 08:19:04 AM EDT.